An artery is a blood vessel that carries blood away from the heart. Whether they are carrying oxygenated blood depends on where in the body the arteries are. In the pulmonary circuit, the arteries carry carbon dioxide filled blood from the heart to the lungs so it can be filled with oxygen. In the systemic circuit, the arteries carry oxygenated blood from the heart to the rest of the body systems. 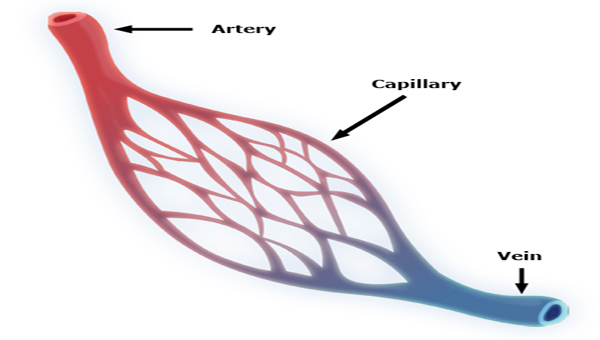 As you can see in the figure above, the arteries split into smaller blood vessels called capillaries when they get to their destination. The capillaries are where the oxygen gets dropped off into the body tissues through diffusion.